Mix sugar, mustard, vinegar, onion, celery seed and garlic powder in small saucepan. Bring to boil over medium-high heat. Cook 2 minutes or until sugar is dissolved, stirring frequently. Remove from heat. Combine paprika, turmeric and salt; rub evenly over chicken. 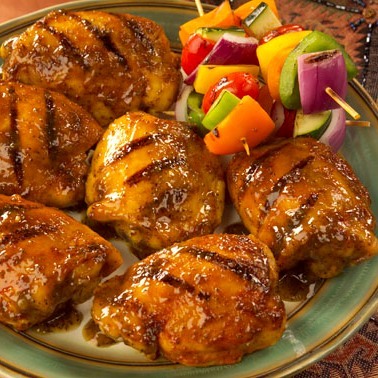 Grill chicken 35 to 40 minutes or until meat near bone is no longer pink and juices run clear (180°F), turning after 20 minutes and brushing with the sugar mixture for the last 5 minutes of the grilling time. Use Your Broiler: Prepare sauce, spice rub and chicken as directed. Spray cold broiler pan rack with grilling spray. Preheat broiler. Place chicken on rack. Broil 30 minutes or until meat near bone is no longer pink and juices run clear (180°F), turning after 15 minutes and brushing with the sugar mixture for the last 5 minutes of the broiling time.